The Centenary Celebration and Christmas Party will be held on Sunday 9 December and Dame Professor Marie Bashir AD CVO has agreed to be the Special Guest Speaker. Please purchase your tickets as soon as possible as numbers are limited and this will be a very special occasion. We are arranging a display of historic pictures and documents in association with the Avalon Beach Historical Society. Tickets are only available to financial members. Come to a ‘drop in’ sessions at Avalon Golf Clubhouse on Saturday 3 November 10-12 noon to find out more and comment on the two site options for the proposed new Creative Art Space. The two sites are Dunbar Park to the rear of the Annex or the Avalon Golf Clubhouse. Please get along and make your views known. 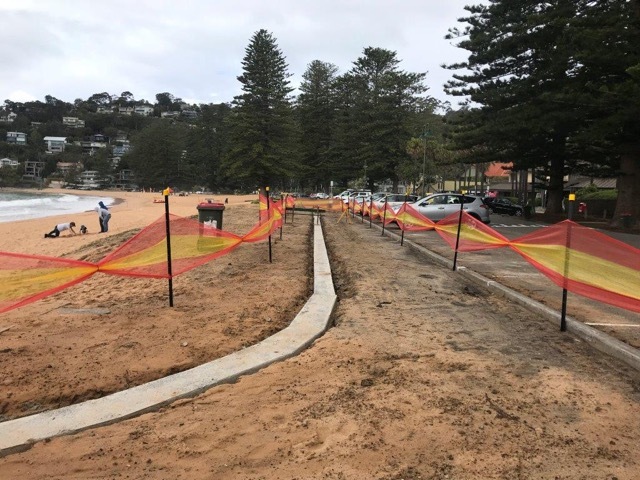 As part of the Northern Beaches Council commitment to greening the Northern Beaches it has issued a draft plan which is available on their website. There is a drop-in session on 8 November or “have your say”on the Council website. Richard West, Ken Allen and Andrew Goldsmith met with the Mayor, Michael Regan, the new CEO of the Council Ray Brownlee and Andrew Johnston from Rob Stokes’office. We took the opportunity to drive around Palm Beach and Whale Beach, and brief the Mayor and the CEO on the local issues. It was a very productive meeting. We are awaiting the final detailed plans for the walkway. The following issues need to be addressed: asbestos in the bush, traffic calming measures, realigning the road and parking. A total approach to the road needs to be taken not just the walkway in isolation. The walkway will commence with the building of a lookout at Norma Road. The Northern Beaches Council is also believed to be considering closure of its office in Avalon on the grounds of under-utilisation. The new Northern Beaches Hospital has opened in Frenchs Forest. It will be a 60% public and 40% private facility. The Association has sent a comprehensive letter to MPs Rob Stokes and Brad Hazzard (Minister for Health) and also Northern Beaches Councillors and the media detailing the need for a fully equipped Emergency Department at Mona Vale Hospital and the serious gaps in services at Northern Beaches Hospital. A copy of this letter is on the website. Please register your concern by emailing Rob Stokes on pittwater@parliament.nsw.gov.au and Brad Hazzard on wakehurst@parliament.nsw.gov.au. The private equity company BGH Capital consortium has foreshadowed a takeover bid for Healthscope, the company in a public/private partnership with the NSW State Government, which is responsible for building and operating Northern Beaches Hospital. The Association has made a submission to NSW Transport on the Move Strategy and this has been supported by CABPRA. 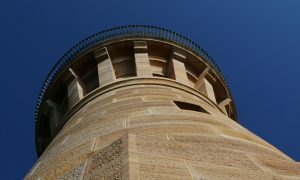 A drop-in session was held in Balgowlah on 25 October concerning the Western Harbour Tunnel and the Beaches Link and more drop-in sessions will be organised. Comprehensive plans are available from Transport NSW and they are asking for feedback. If approved after this consultation phase, timing is likely to be early in the 2020s for commencement with the project likely to take 6 years. 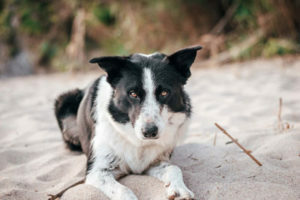 Pittwater Unleashed is critical of the delay in introducing the trial of off-leash periods for exercising dogs on Station Beach. 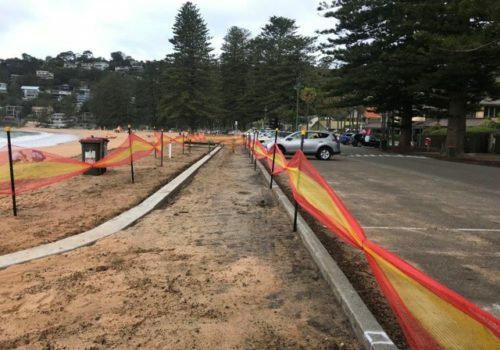 They have held a meeting with Ray Brownlee, the new CEO of the Northern Beaches Council and are hopeful that the trial will proceed after the six week consultation period. Richard West has been appointed to the My Place Avalon Community Reference Group and meetings have started. Maintaining the village atmosphere in Avalon is the priority. 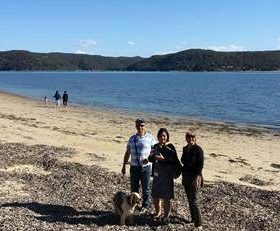 It is hoped that visitor signage will be installed in Avalon and in Palm Beach at the ferry wharf or Pittwater Park. It is important that Council rates on outdoor dining spaces should be kept at reasonable levels in Palm Beach and Avalon so that businesses can flourish. Councillor Alex McTaggart intends to put forward a motion at NBC’s November meeting calling for a complete review of outdoor seating including charges. parking regulations, including timed parking in Pittwater Park (S), which should commence on 1 December 2018. During this period the Association will assess whether the number of 8-hour parking bays should be reduced to get maximum turnover in the limited space and make recommendations. We believe that compliance will be the most important and difficult issue. 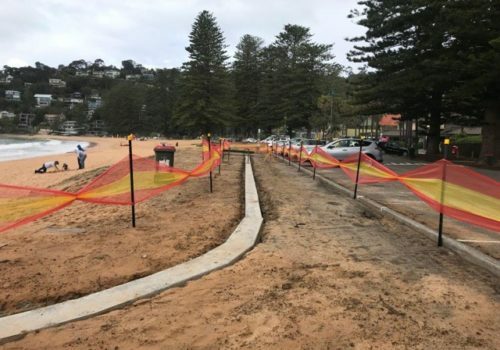 Offshore residents will have exclusive use of Pittwater Park(N) with special parking stickers. 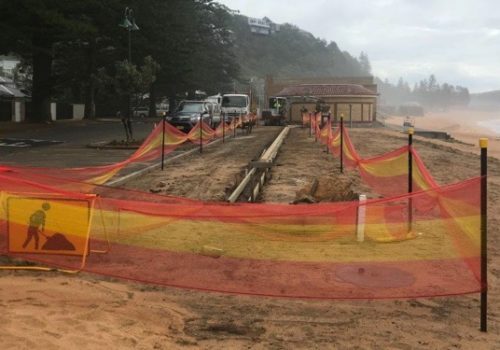 The Committee are maintainig pressure on the Council and Rob Stokes to arrange with Roads and Maritime Services the relocation of the median strip near Barrenjoey House and Palm Beach Fish & Chips which has caused many accidents. Two more accidents occurred in early October. The No Stopping signs for Barrenjoey Road near the junction with Kevin Road have been approved. There is no further progress with the provision of toilets and water by the National Parks and Wildlife Service. 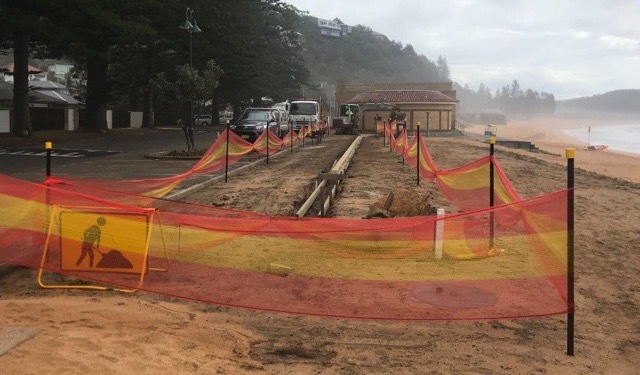 The delay is unacceptable particularly since the holiday season is about to start and the new walkway at Palm Beach will mean extra summer visitors during what is likely to be a very hot summer. The Association is suggesting warning signs at the base of the slope as some climbers do not seem to be aware of the steepness of the climb and are getting into difficulties. 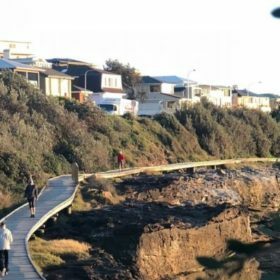 There is an urgent need for a walkway between Careel Bay and Surf Road. The Association will be discussing this with the Council. The NSW Government wishes to stop vessels anchoring because of damage to the sea-grass although the damage is minimal and the area needs to be available as a refuge in bad weather. The Association has lodged a submission (attached to last month’s newsletter) and a reply has been received from Jonathon O’Dea, Parliamentary Secretary to the Premier, confirming that our views will be taken into account before finalising their proposal. It is important that the sea plane service, commercial barge operation and boat hire should not be hindered. The NSW Government reforms were passed on 14 August 2018 and are expected to come into operation in 2019. There will be a mandatory Code of Conduct (which has yet to be produced) and this will take into account noise levels, disruptive guests and effect on local amenities. It will include provision for “Two Strikes and you are out” and this will mean two strikes in any two year period to be followed by a ban for five years. Complaints will be assessed by independent adjudicators. While owners are present and part of the property is let it will be considered an exempt development and letting can continue for 365 days a year. If the host is not present, i.e. the whole property is let, this is reduced to 180 days a year. The Association is concerned that the Council is proposing an experiment (on Long Reef) to spray the weeds on inaccessible parts of the cliffs with Roundup using a helicopter drone. This is part of a Sydney plan to eradicate Bitou or Boneseed weed. We have discussed the matter with the NBC Environmental Officer who has given an assurance that it will be targeted, safe and controlled. We will be monitoring the process if it goes ahead after the consultation process. Comments have been received regarding a houseboat which is now moored on Pittwater. An enquiry to Maritime Services has revealed that it can be legally moored for one month on a mooring. Landscaping is well under way on Palm Beach. Life-saving machines improve survival chances of heart attack. October is nationally recognised as defibrillator awareness month and publicly accessible defibrillators have been rolled out across the Northern Beaches in high-priority areas to improve survival rates of cardiac arrest victims. Council have funded five of six pedestrian emergency kiosks, made by Cardiac Responder, with the sixth machine kindly donated by The Cardiac Arrest Survival Foundation – a Sydney-based not-for-profit organisation who covered the costs for the installation. Known as Zapstands, the public access defibrillator systems have been installed across key locations and Council plan to roll out two further systems in 2018/2019 at Lionel Watts Reserve, Frenchs Forest. The second kiosk will be installed at Pittwater Park at Palm Beach and this will be donated by the Association. The Mayor, Michael Regan, has said if the system can save one life then it is money well spent. “Cardiovascular disease claims one life every 15 minutes which is a very scary statistic. I’m so pleased we are able to roll out our ZAPSTANDS across the region – the technology is just amazing and simple to use in an emergency. These machines are accessible 24 hours a day which mean anyone can use them and they are monitored so as soon as you pull out the defibrillator a call to triple-0 is made so help won’t be far away, but in the meantime a cardiac victim has a chance of survival. There is also a defibrillator located outside the office at the Cabbage Tree Club. The President, Michael Crowley, informed us at the recent morning coffee meeting that this defibrillator is accessible twenty four hours a day for members of the public to use.